This month, we rededicate ourselves to stopping one of the greatest human rights abuses of our time. Around the world, millions of men, women, and children are bought, sold, beaten, and abused, locked in compelled service and hidden in darkness. They toil in factories and fields; in brothels and sweatshops; at sea, abroad, and at home. They are the victims of human trafficking -- a crime that amounts to modern-day slavery. As Americans, we have long rejected such cruelty. We have recognized it as a debasement of our common humanity and an affront to the principles we cherish. And for more than a century, we have made it a national mission to bring slavery and human trafficking to an end. My Administration has been deeply commited to carrying this legacy forward -- beginning with trafficking that happens on our own shores. We have strengthened protections so all workers know their rights, expanded efforts to identify and serve domestic victims, devoted new resources to dismantling trafficking networks, and put more traffickers behind bars than ever before. In the months ahead, we will continue to take action by empowering investigators and law enforcement with the training they need, and by engaging businesses, advocates, and students in developing cutting-edge tools people can use to stay safe. We will invest in helping trafficking victims rebuild their lives. And as one of the world's largest purchasers of goods and services, the Federal Government will keep leading by example, further strengthening protections to help ensure that American tax dollars never support forced labor. Our commitment to stopping human trafficking does not end at our borders. As a leader in the global movement to combat this scourge, the United States has renewed sanctions on governments that harbor the worst offenders. We have partnered with groups around the world to help men, women, and children escape their abusers. And recognizing that no country can meet this challenge alone, we have aided others in addressing modern slavery's root causes, and encouraged nations across the globe to pass comprehensive anti-trafficking laws, enforce them rigorously, and care for survivors. We know the road ahead is long, and change will not come easily. But as we renew our pledge to erase modern forms of slavery from the face of this earth, let us also draw strength from the movements of the past. We recall the words of the Emancipation Proclamation -- that every life saved is "an act of justice," worthy of "the considerate judgment of mankind, and the gracious favor of an Almighty God." We reflect on the Amendment that wrote abolition into law, the decades of struggle to make its promise real, and the Universal Declaration of Human Rights that has drawn nations together in the pursuit of equality and justice. These achievements once seemed impossible -- but on this day, let us remember that they were not, and let us press on toward the future we know is possible. 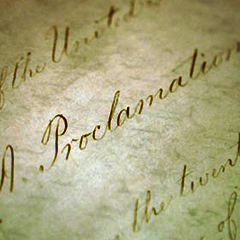 NOW, THEREFORE, I, BARACK OBAMA, President of the United States of America, by virtue of the authority vested in me by the Constitution and the laws of the United States, do hereby proclaim January 2013 as National Slavery and Human Trafficking Prevention Month, culminating in the annual celebration of National Freedom Day on February 1. I call upon businesses, organizations, faith-based groups, families, and all Americans to recognize the vital role we can play in ending all forms of slavery and to observe this month with appropriate programs and activities.